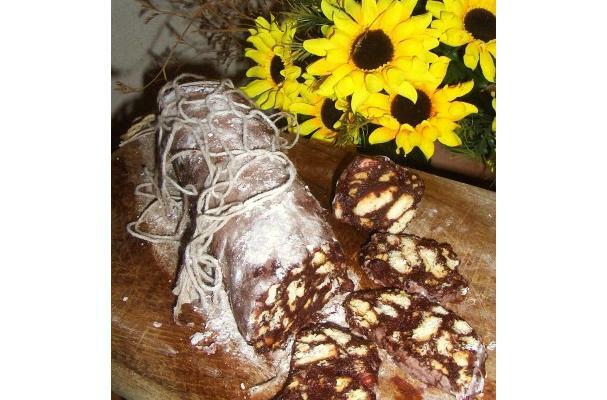 Foodista | Recipes, Cooking Tips, and Food News | Chocolate "Salami"
200 gms cookies that do not soften.. Spread the mixture on aluminum foil and shape into a sausage. To give a better shape, wrap in aluminum and roll. Close the foil as compact as best to give substance to the "salami". Place in refrigerator and keep it there for at least 12 hours. (Best prepared the night before consumption). Remove from refrigerator and "flour" with powdered sugar. Serve on a cutting board and cut into slices.